The different sized dogs can be crossbred. The colours vary from very pale to coal black - colours may be solid or spotted. There can be some hair on the head and tail, but the body must be hairless. Nice skin is soft and elastic. The set of teeth is nearly always abnormal, there are seldom premolars. The dog ought to have canines, the tounge may sometimes hang out of the mouth. The litter of a Peruvian Hairless Dog has normally 25-50% coated puppies. ČMKÚ registers coated dogs and they are used in breeding programs. However, in Czech Republic they are not accepted to enter official shows, only the club show. The character of this breed is rather peaceful but very alert. The dog deeply loves its family and in the same time he is very reserved towards other people. Of course the dogs are individuals, they may differ a lot from each other. The Peruvian Hairless Dogs, as well as other breeds, need to be socialized very well, so that they feel comfortable in different situations, places and with strange people and dogs. The socialization should continue throughout the dog’s life. 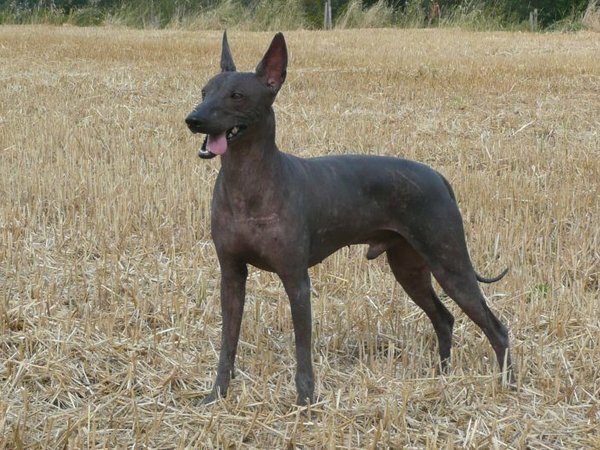 The history of the Peruvian hairless dog started a long time ago - already before the most blooming time of the Inca culture. Evidence of this has been found for example from the markings, drawings on old bowls and other dishes from the Inca time. The Incas admired very pale coloured dogs -they kept them in caves, so they didn’t get tanned at all. In this caves grew orchids as well, that’s why are they also called „Peruvian Inca Orchid“. Hairless dogs were not able to be with other dogs so there was no crossbreeding. According to some experts, this dog was introduced in Peru during the Chinese immigration, soon after the promulgation of the law abolishing the slavery of the blacks by the president of Peru - Don Ramon Castilla. On the other hand, other searchers suppose, that this dog comes from the African kontinent through the intermediary of nomads, who arrived in America accompanied by their hairless dogs. Yet another possible explanation is that the presence of this dog would be due to the migration of men and thein dogs from Asia to America through the Beringg Strait. Next to all these suppostitions there are certain proofs such as the representations appearing on ceramics, where in many cases the hairless dog has replaced puma, snake or falcon. As we can gather from the reproductions, the hairless dog appears during the pre-Inca archeological periods (300 BC - 1400 AC). When the Spaniards arived at the Tahuantinsuyo they encountered a different civilization - socially and politically organized by the vision of the Andean man, without the influence of the advanced societies, that were developing on the Old kontinent. They discovered a rich variety of fauna and flora, „strange“ species, never seen before by the European eye rapidly captivated their interest and curiosity. Many of these species were taken to Spain as souvenirs of the New world and aminy them some strange dogs without hair. An original and unpublished manuscript, kept in Madrid, contains the observations of Francisco de Hernandez, where he reports that: „in New Galicia there is a breed of dogs without hair, of smooth coloured skin, similar to the lebrels, altough they are taller and have a different way of barking than the others“. Later the Peruvian writer Guillermo Gallardo narrated: „when Philips the Beautiful of Spain arrived, they presented him with some souvenirs brought from the occidental lands recently discovered. On Wednesday 22. june of 1502 the son-in-law of the Catholic Konga stayed in his lodgings, but they showed him two very new things. One was a totally black dog with no hair at all that stretched out his snout like a black woman. The other a green parrot hardly bigger than a small monkey, talking of was credible“. These statements collected and narrated by the first chroniclers who arrived with the expeditionary host sof Francisco Pizarro, are the first news we have about the existence of the Peruvian hairless dog. Nonetheless, its origin is a story not yet told that takes us back more than two thousand years. 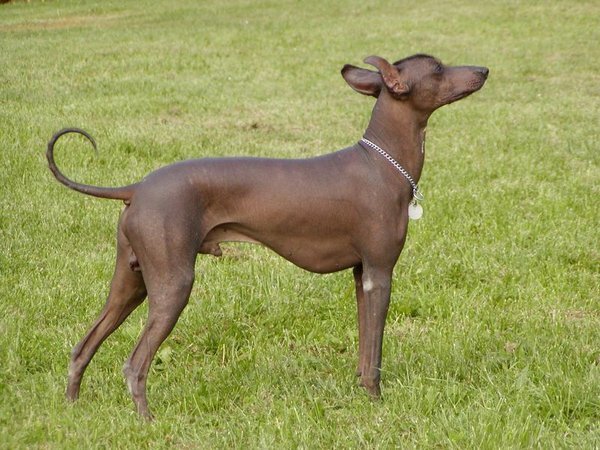 The Peruvian Hairless Dog’s movements are very light and elegant. Some of them move like Paso Fino horses. And they still achieve high speed, even on a track, he is a good runner - they have been used as carriers, they delivered mail from village to another. The Peruvian Hairless Dog can be used like a hot bottle in a bed. And no fleas or bugs! Believe it or not, the hairless dog is ascribed even medical and therapeutic effects, thanks to its higher temperature and the maximal pleasure in physical contacts with humans (blood pressure problems, rheumatism and positive effect on human mind). 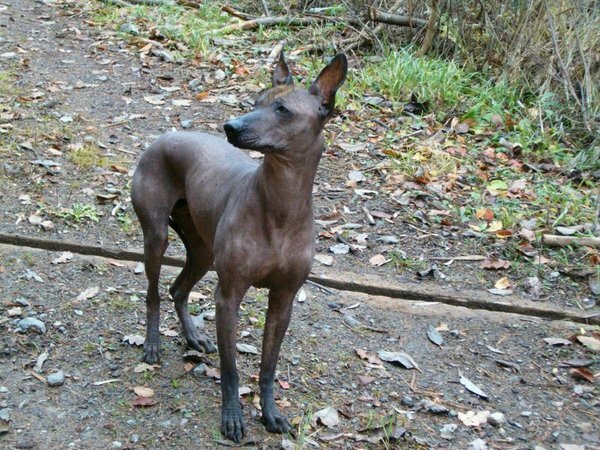 In the seventies was the Peruvian Hairless Dog accepted by FCI as „Inca Orchid Dog Moonflower“. In Peruvian it’s „Caa - Alego“ (the undressed dog). In 1987 at the FCI congress in Tel-Aviv, was the name changed to „Perro sin pelo del Peru“ (hairless dog from Peru) at the request of the Peruvian Kennel Club. 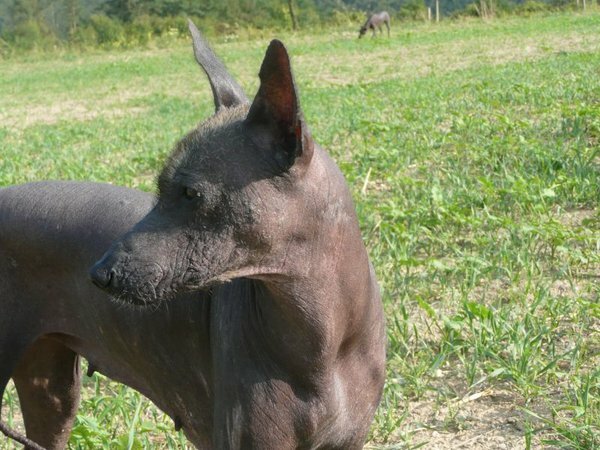 The Peruvian Hairless Dog occurs in both, bare and hairy form, FCI accepts only the bare one. 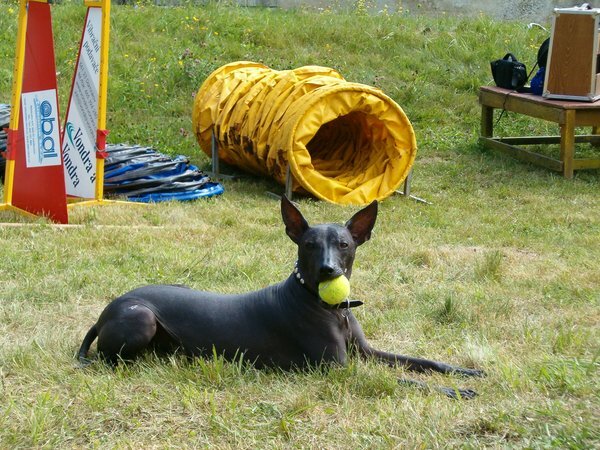 How did the Peruvian Hairless Dog get to the Czech Republic? In 1977 on a friendly visit in GDR, the Cuban delegacy gave as an official present a pair of the Peruvian Hairless Dogs. Because noone really cared about them, soon were they given to the Berlin Zoo…but no animal paradise was awaiting them there either. They were reproduced, during winter they had to freeze in a caravan and the ones that survived ended up in experiments on animals. There wasn’t anyone who would care about the death of the little hairless one. Only the sensitive people from the greyhound kennel decided to act and saved a few of them. Two of them, siblings, were given to Dr. Pacltová in Czechoslovakia and they were registered in 1981 into the Czech central breeding book. What else to say about this breed? The one, who will once buy the hairless dog, will fall for their dog charisma for ever.